(a) Demand deposits - There is no fixed tenure of these deposits. The deposits are repayable on demand. The account holder can withdraw his money anytime. Savings account and Current account are demand deposits. (b) Term/Time Deposit - Here there is a fixed tenure of the deposit. Recurring Deposit and Fixed Deposit fall under this category. 1. Current Deposit Account - This account is generally meant for businessmen. This is because they have a high frequency of bank transactions. They usually have multiple transactions daily. Under this account, there is no restriction on the number of withdrawals and hence is most suitable for businessmen. No interest is paid by the banks on such accounts. The customer gets the cheque book facility for the current account. Some current account holders are also given overdraft facility. Overdraft is a credit facility offered to current a/c holders. An overdraft is like a temporary loan given to the customer to clear/honour cheques already issued by him (in case of insufficient balance in the current account of the customer). For example, say you have a current a/c but balance as on date is zero. Let us say you have been assigned an overdraft limit of Rs.50,000/- on your current a/c. A cheque of Rs.25,000/- issued by you has come for clearing today. Bank will honour the payment even though you have zero balance. You can later repay Rs.25,000/- back to the bank and you will be charged interest from today till the day of repayment of this amount. There is an upper limit on the amount of overdraft for each eligible customer which is decided by the bank itself based on the financial documents of the account holder, his past record and the relationship of the customer with the bank. 2. Savings Deposit Account - This account is made for the general public especially salaried people. The main objective of having the savings account is to cultivate the habit of saving among people. Interest is also paid by the banks on the savings account. The interest rate is moderate (less than the rate of interest offered on recurring or fixed deposit account). However, there are restrictions on the number of withdrawals that can be made through savings account and hence this type of account is not suitable for businessmen. Customers are generally required to maintain a certain minimum balance in the account. Failure to maintain the minimum balance may result in minimum balance charge being deducted from the savings account. No overdraft facility is offered on a savings account. Saving account holders are given cheque book facility. 3. Recurring Deposit Account - This type of account is also called the cumulative time deposit account. It is meant to cultivate the habit of savings among the economically weaker section of the society. Under this type of an account, the customer is allowed to deposit a certain small but fixed amount (Rs.50, Rs.100, Rs.500 etc.) every month for a fixed period of time. The customer gets back the total amount deposited along with interest at the end of the specified period. This type of account does not have the facility of withdrawal. The chequebook facility is not given to recurring deposit account holders. However, they do get a passbook which shows the amount deposited every month along with the interest amount for each month. 4. Fixed Deposit Account - Under this type of account, a one-time lump-sum deposit is made by the customer for a fixed period of time (generally 3 months to 10 years). The customer cannot withdraw the amount during this period (All banks these days allow pre-mature withdrawal of fixed deposit i.e, withdrawal of fixed deposit amount before the end of the term of the deposit. Banks deduct some amount from interest earned as a penalty for pre-mature withdrawal). However, he can take a temporary loan against the fixed deposit receipt (FDR). At the end of the fixed period, the customer can either withdraw the amount or renew the fixed deposit. The rate of interest offered under this account is highest among all the four main types of accounts. This type of account does not have a passbook or cheque book facility. The customer gets a fixed deposit receipt (FDR) as a proof of the fixed deposit. 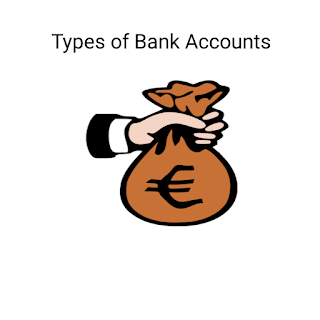 Multiple Option Deposit Account: A lot of banks have recently introduced this type of bank account. It is a type of Savings Account in which deposit in excess of a particular limit gets automatically transferred into Fixed Deposit. For example, suppose the limit for automatic transfer of funds from savings account to fixed deposit is Rs.10,000/-. If you are having a balance of Rs.50,000 is this type of an account, Rs.40,000/- will be automatically transferred to a fixed deposit account. This means you would earn a higher rate of interest on Rs.40,000/- (since rate of interest on fixed deposit is always more than interest on savings account).On the other hand, in case adequate fund is not available in the Savings Bank Account so as to honour a cheque that you may have issued, the required amount gets automatically transferred from Fixed Deposit to the Savings Bank Account. The balance amount remaining in fixed deposit account (after transfer of required amount from fixed deposit to savings account) continues as Fixed Deposit.